Screen frame is 12'2". 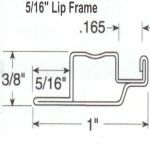 (Exceeds standard carrier lengh) Unless otherwise notified product will be cut at 8' 0 " and both pieces will be shipped. Please call with any questions or for variations in cuts. 90 pieces @12'2" can be shipped to you. For less than a box our online ordering system will calculate freight by adding your items to our shopping cart and entering your zip code. See items sold by less than a box below. 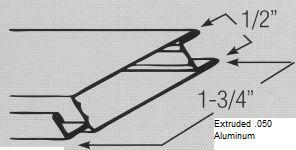 When Window Screen and Solar Screen framing is new, it is not straight, it is curved outward, bowed (or cambered). The screen frame is pulled straight in order to create constant tension on the screen fabric at fabrication. Please note this is a designed attribute of the frame. 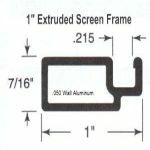 Order Minimums - Based on packaging time and expense a minimum of 20 pcs of Screen Frame is Required. We offer cuts at (8'0"/4'2") (7'0"/5'2") & (6'1"/6'1"). For an added cut charge we can make specialized cuts if required. 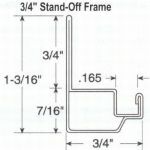 Slider frame has a 10 piece minimum order.